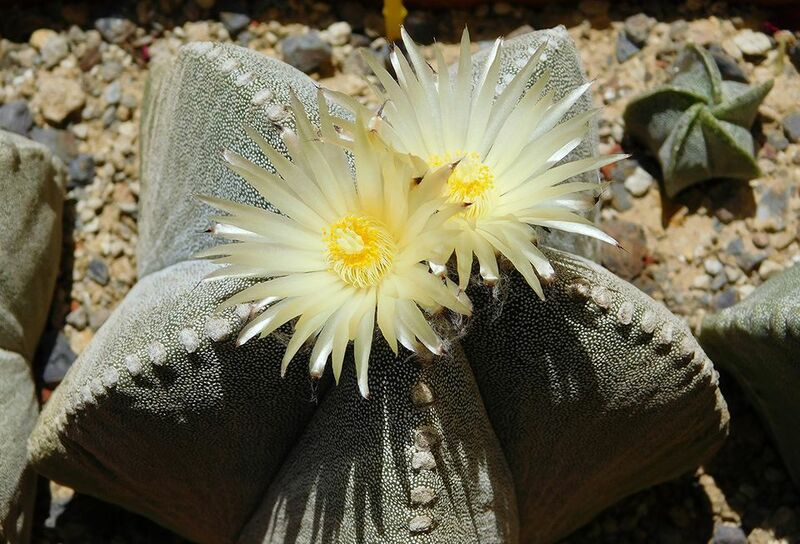 Astrophytum is a genus of four North American cacti, all of which are found in Mexico and some of which appear in the United States as well. Known for their beauty, these are quite popular among domestic cacti for their flowering habit; their flowers are usually yellow or white. Astrophytums grow solitary bodies, but some species will become short columnar later in life if properly maintained. Some also have distinctive white flecks on their bodies. Many of these cacti are prized: for example, A. asterias is extremely valued by the Japanese, especially the ‘Super Kabuto’ strain. However, they are extremely difficult to cultivate and are often grafted onto an echinopsis for best results; most gardeners would be better off sticking with A. ornatum or A. myriostigma, both of which are highly rated. Astrophytums are ribbed and covered in aureoles from which sharp spines protrude, and these spines can be black or golden. They’re usually slow growing, and although mature specimens are quite impressive, it can take years to nurture an Astrophytum to that level. Their free-growing flowers, however, which stick up from the apex, are quite lovely, and if properly grown these are among the more pleasant species of North American cacti. Light: Very sunny conditions, with hours of direct sunlight every day. Water: Astrophytums like dry conditions, with sporadic watering in the summer and then a dry winter. During the growing season, water infrequently. Temperature: They like hot temperatures above seventy degrees during the summer and then prefer cooler, more temperate winters. Soil: Typical cactus potting soil should be fine, ideally one containing some loam or peat. Fertilizer: Fertilize during the growing season with a balanced, diluted fertilizer like a 20-20-20 mixed into their water. They propagate by seed, and their seeds are fairly fragile: be gentle with them before planting. They also have a fairly short shelf life and need to be planted quickly after harvesting to have a reasonable chance at rooting. When planting them, make sure they’re in well-aerated soil, then seal the newly planted seeds in to help catch moisture and heat. It can help to soak seeds before they’re planted. Repot regularly to help them develop. Astrophytums should be repotted at the beginning of the growing season for best results, allowing them to grow into the impressive specimens for which the genus is known. Protect your hands before repotting due to their stiff spikes and lift the plant out all at once, then replace in a larger pot and backfill with soil. Don’t overwater or overfeed newly repotted cacti, as disturbances can be hard on them. There are four species of Astrophytums, and the most popular is probably A. myriostigma, which displays the genus’ white flecks and can grow up to eight inches in height. A larger variant is A. ornatum, which is also the fastest-growing plant in the genus and has been known to reach up to three feet. The most prized, rare, and difficult is the tiny A. asterias, which only grows to about four inches in diameter. Astrophytums are not vigorous plants, and they require a lot of patience to reach their full potential. Keep regularly watering and feeding them during the growing season and repot annually to give them space to develop. They need a temperate, dry winter as well, and make sure not to overwater them to avoid rotting their roots. If given sufficient care, they will develop marvelous flowers once they reach maturity. Watch out for common cactus pests like aphids and scale, as well—these can often be taken care of by a good eco-friendly pesticide, or simply wiped away with a cloth.